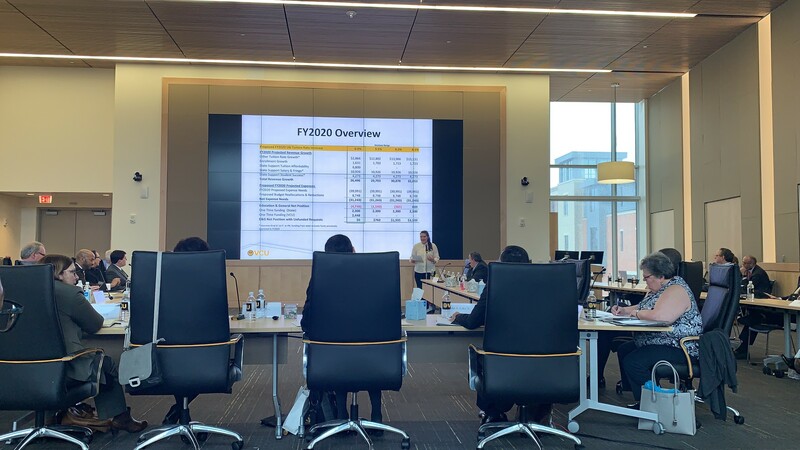 Just last year, Virginia Commonwealth University’s Board of Visitors approved a 6.4 percent increase in in-state tuition and fees without allowing a public comment period. Because students were not permitted to directly address the public college governing boards in Virginia, Partners launched an advocacy campaign at VCU where they could share their concerns. Included was an online petition, an email campaign, joint statements by campus organizations and video testimonials featuring students frustrated with the rising cost of tuition and the lack of transparency. A diverse student coalition came together in a united stance against the tuition hike, and over 400 individuals signed our online petition. In the absence of a public comment period during the meeting where the board voted to set tuition rates, students presented VCU President Michael Rao and the Board’s chair with paper copies of the petition and student statements. In the end, all but one Board member voted in favor of a significant tuition increase. Read more here. Flash forward to 2019. . . and the atmosphere at VCU stands in stark contrast to 2018. During the recent legislative session, the General Assembly passed a budget that allocates an additional $52.5 million for public colleges and universities who agree to freeze in-state tuition for the coming year. And based on the conversation that unfolded during the budget presentation, it appears that VCU’s Board of Visitors is on track to approve this proposal during their May 10 meeting. While the proposal calls for a freeze of in-state tuition and mandatory E&G fees, it also calls for an $106 increase in mandatory non-E&G fees for all students. But the discussion that unfolded following the presentation was even more encouraging. As Board member Richard Wagoner said, “I wonder if it’s a better story to say we have a 0 percent tuition and fee increase,” nor was he alone. But a proposal to freeze tuition was not the only notable difference in this year’s budgetary process at VCU. Following the budget presentation, the Board of Visitors opened discussion and held a public comment period in front of the full board. This action was particularly noteworthy considering that legislation mandating a public comment period does not go into effect until July and does not require the attendance of the full board. Additionally, the VCU Board is soliciting public comment online for those who were unable to attend the meeting. In their remarks, students expressed appreciation for the proposed tuition freeze while also articulating concern for the mandatory fee increases. Elisa Maurice thanked Board members for “making space for students” in the decision-making process before pointing to the impact rising college costs have on the student body. According to VCU student, and Partners’ campus coordinator, Nick Da Silva, $106 equates to two days of work for a student making minimum wage. This positive experience validates our year-long fight for mandated public comment periods before tuition hikes. On that score, VCU has earned applause for recognizing the value of student input, not to mention voluntarily holding public comment before the mandate takes effect. And across Virginia, other public colleges and universities will undoubtedly follow suit. A lot can change in a year, and the hard work of a broad coalition of student and parent advocates, community leaders, and organizations has paved the way towards brighter outcomes at VCU.